The key challenges for societal resilience result from external shocks, spillover, and feedback cycles. These can represent threats to existing cooperative arrangements, but may also provide opportunities to develop novel solutions for care, inclusion, and work. 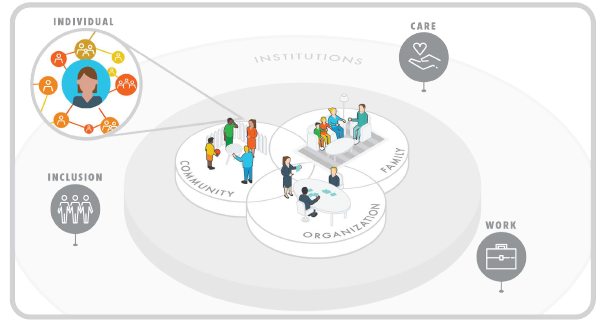 This can be achieved by specifying which individual and societal values need (re-)alignment; understanding the psychological mechanisms that connect individuals through their common identities, goals, and networks; and identifying which institutional provisions and arrangements are needed to address these. The analytical tools are offered by the SCOOP approach, which integrates theoretical insights and links empirical evidence from different disciplinary and methodological perspectives to develop roadmaps for effective policy strategies and solutions. comparing the effectiveness of different institutions under different circumstances (tailoring solutions to specific sociological contexts and circumstances). These features of our approach allow us to develop and test interventions to be effective and have long term effects.